Poor visibility and road conditions have been reported from Montreal River Harbour to the Agawa Hill. Earlier this evening (10:30) a number of transports were stuck on the Agawa Hill. Currently, very poor visibility has been reported in the Montreal River Harbour/Alona Bay area. This snow squall warning ended at 12:21 a.m. This advisory ended at 2:10 a.m.
Winter weather travel advisory in effect for this evening and overnight. 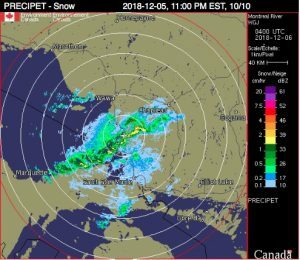 Lake effect flurries are affecting areas east of Lake Superior this evening and are expected to continue to do so through much of the night. 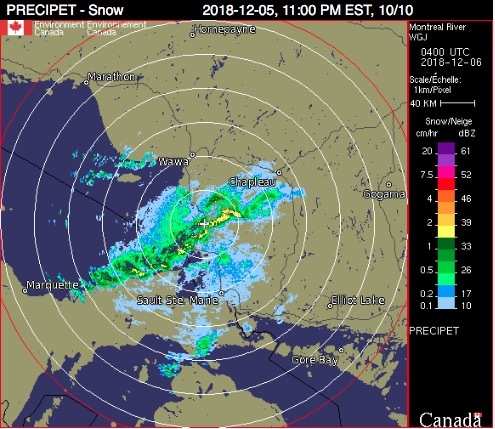 A particularly intense band north of Montreal River is expected to shift southward during the night giving a brief period of intense snowfall and very poor visibility to areas between Sault Ste. Marie and Montreal River. This band should move through fairly quickly which will help to limit accumulations somewhat. Amounts of around 10 cm or so are possible by late overnight. Travel along Highway 17 is expected to be very hazardous at times tonight.